Most images of North Korean leader Kim Jong Un that are seen by the public are from the country's state-owned Korean Central News Agency. This undated picture released by the KCNA on April 14, 2017, shows him inspecting troops at an undisclosed location in North Korea. Most images of North Korean leader Kim Jong Un that are seen by the public are from the country's state-owned Korean Central News Agency.</br></br> This undated picture released by the KCNA on April 14, 2017, shows him inspecting troops at an undisclosed location in North Korea. This undated picture released by KCNA on March 19, 2017, shows Kim Jong Un inspecting the ground jet test of a newly developed high-thrust engine at the Sohae Satellite Launching Ground in North Korea. North Korean leader Kim Jong Un and his wife, Ri Sol Ju, visit the Mangyongdae Revolutionary School in Pyongyang to plant trees with its students on Tree Planting Day. North Korean leader Kim Jong Un visiting the People's Theatre to mark the 70th anniversary of the founding of the State Merited Chorus in Pyongyang, Feb. 22, 2017. North Korean leader Kim Jong Un inspects the headquarters of Large Combined Unit 966 of the KPA at an undisclosed location, March 1, 2017. North Korean leader Kim Jong Un visits a newly built Pyongyang bag factory in this undated photo released by North Korea's Korean Central News Agency, Jan. 5, 2017. North Korean leader Kim Jong Un visits the Wonsan Army–People Power Station in this undated photo released by North Korea's Korean Central News Agency in Pyongyang, North Korea, Dec. 13, 2016. North Korean leader Kim Jong Un provides field guidance to Farm No. 1116 under KPA Unit 810, in this undated photo released by North Korea's Korean Central News Agency in Pyongyang, Sept. 13, 2016. North Korean leader Kim Jong Un looks though binoculars at the site of a ballistic missile launching at an undisclosed location in North Korea in this undated picture released by the KCNA, Sept. 6, 2016. North Korean leader Kim Jong Un inspects a test-fire of strategic submarine-launched ballistic missile at an undisclosed location in this photo released by North Korean Central News Agency, Aug. 25, 2016. North Korean leader Kim Jong Un inspects the Taedonggang Combined Fruit Farm in Pyongyang in this undated picture released by the KCNA, Aug. 25, 2016. North Korean leader Kim Jong Un watches a performance by amateur art groups of the Korean People's Army in Pyongyang, in this undated picture released by the KCNA, July 16, 2016. North Korean leader Kim Jong Un inspects the Paektusan Architectural Institute in Pyongyang in this undated picture released by the KCNA, July 14, 2016. North Korean leader Kim Jong Un inspects a test of the surface-to-surface medium long-range strategic ballistic missile Hwasong-10 at an undisclosed location in North Korea in this undated picture released by the KCNA, June 23, 2016. In an undated picture released by the KCNA, June 4, 2016, Kim Jong Un inspects the remodeled Mangyongdae children's camp in Pyongyang. Kim Jong Un waves from a balcony of the Grand People's Study House after a parade marking the end of the 7th Workers Party Congress in Kim Il Sung Square in Pyongyang, May 10, 2016. Kim Jong Un inspects a test-fire of a new large-caliber multiple launch rocket system at an undisclosed location in this undated picture, released by the KCNA March 4, 2016. Kim Jong Un attends the Third Meeting of Activists in Fisheries under the Korean People's Army in Pyongyang, in an undated photo, released Dec. 29, 2015. In an undated picture released by the Korean Central News Agency, Dec. 12, 2015, Kim Jong Un visits a newly renovated catfish farm at an undisclosed location in North Korea. Kim Jong Un greets the North Korean women's soccer team at Pyongyang International Airport after it won the 2015 EAFF East Asian Cup, in this photo released Aug. 10, 2015. Kim Jong Un visits a newly constructed nursery and orphanage to mark International Children's Day in Wonsan, North Korea, June 1, 2015. Kim Jong Un visits a state-run farm in this undated photo released on June 1, 2015, by North Korea's Korean Central News Agency. Kim Jong Un and his sister Kim Yo Jong, circled, visit the Kim Il Sung University of Politics in Pyongyang, North Korea, March 9, 2014. Kim Jong Un rides a ski lift during an inspection of the Masik Pass ski resort, near Wonsan, North Korea, Dec. 31, 2013. Workers at a mushroom farm with Kim Jong Un in an undated photo released by the Korean Central News Agency in Pyongyang, July 16, 2013. Kim Jong Un, center, attends a plenary meeting of the Central Committee of the Workers' Party of Korea in Pyongyang, March 31, 2013. In an unverified photo released by the KCNA on March 29, 2013, Kim Jong Un, seated, meets with top military officials. Kim Jong Un, center, is welcomed by members of a military unit on Jangjae islet in North Korea, March 7, 2013. Kim Jong Un, front left, and former NBA star Dennis Rodman, front right, watch North Korean and U.S. players in an exhibition basketball game at an arena in Pyongyang, North Korea, Feb. 28, 2013. In his first public appearance since North Korea's third nuclear test, Kim Jong Un attends an award ceremony Pyongyang, North Korea, Feb. 15, 2013. He is presenting an official with a wristwatch engraved with the name of his father, Kim Jong Il. Kim Jong Un with other North Korean officials, Feb. 15, 2013. Kim Jong Un delivers a New Year's Day address in Pyongyang, North Korea. Kim Jong Un presides over a national defense meeting with his top officials, Jan. 27, 2013. Kim Jong Un views a military parade in Pyongyang to celebrate 100 years since the birth of late North Korean founder Kim Il Sung, April 15, 2012. Kim Jong Un and North Korean military officers attend a mass meeting called by the Central Committee of North Korea's ruling party, in Pyongyang, April 14, 2012. Kim Jong Un visits the Mangyongdae Revolutionary School in Pyongyang for the celebration of the Lunar New Year, Jan. 23, 2012. Kim Jong Un during a photo session with participants in the national meeting of chiefs of branch social security stations at an undisclosed location in North Korea, Nov. 27, 2012. Kim Jong Un celebrates with General Satellite Control and Command Center staffers at the launch of the Unha-3 rocket, in Pyongyang, North Korea, Dec. 12, 2012. Kim Jong Un and his wife, Ri Sol Ju, inspect the Rungna People's Pleasure Ground in Pyongyang, July 25, 2012. 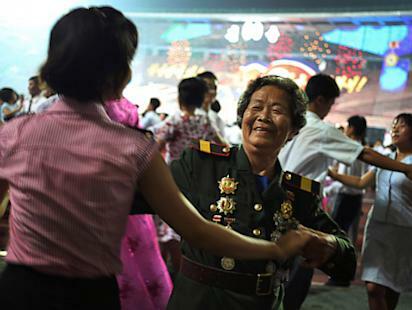 Kim Jong Un, center right, at a performance by the North Korean band Moranbong, in Pyongyang, July 6, 2012. 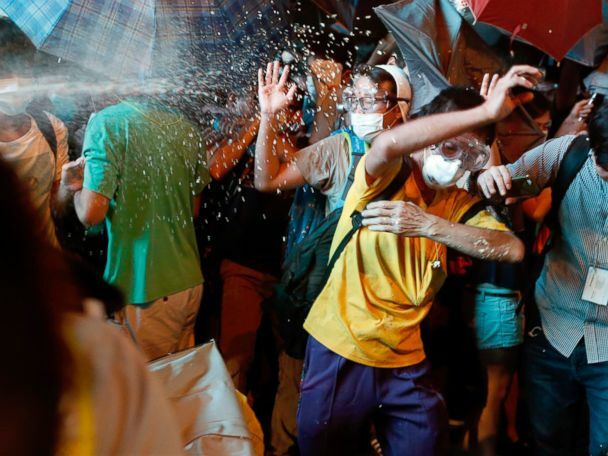 Pro-democracy protests met by tough police response, bringing Hong Kong to standstill.